Need help making decisions such as whether you should buy that sweet upgrade, or say no to a random /tell asking you to heal for a pick up group? Well look no further, with Gnome Sage you can now ask your very own pocket gnome soothsayer. Just ask him your question and through gnomish ingenuity and experimentation, he will express his agreement or counsel caution. 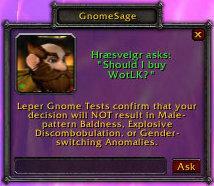 On occasion, Gnome Sage may even express bewilderment when the dilemma is not as cut-and-dried as it seems to be. A fun, little addon that gives you your very own Pocket Gnome to help you make decisions as only a crafty, humorous companion can. For the adventurous types, you can customize Gnome Sages YES/MAYBE/NO responses easily by editing Localization.enUS.lua in your preferred text editor.